This text is a varied collection of moral and didactic writings, ranging from Roman Seneca in the 1st century to the North African apologist Fulgentius in the 6th to the near-contemporary sermons and the recent Moralitates of the learned Englishman Holcot. The manuscript, which contains a variety of authors known all across Europe, is a good example of a late medieval compendium. 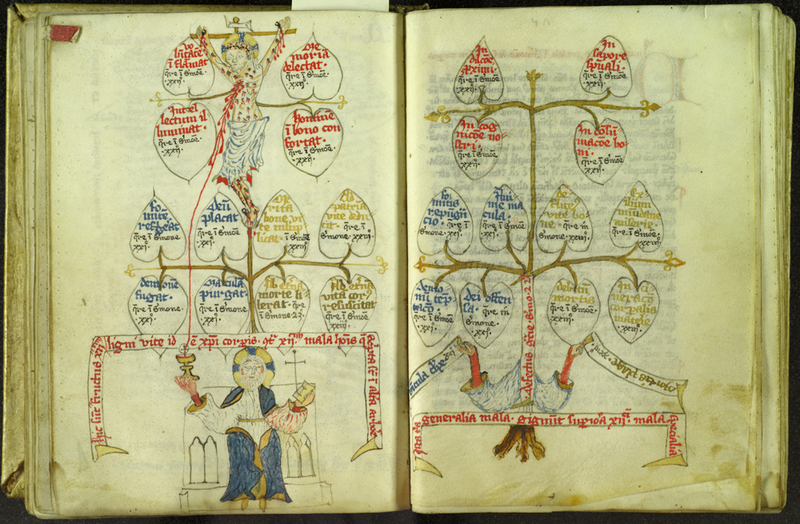 Tree Diagrams were popularized in the 12th century. The leaves exhibited from this manuscript contain an illustration of the Lignum Vitae (Tree of Life), a common medieval diagram with an instructive purpose. In the exhibited folios, a figure of the crucified Christ on the top of the page pours blood from the wound in his side into a chalice held by an Evangelist on the bottom. In his other hand, the Evangelist holds a book, above which is imposed a simple line drawing of a cross. The diagram illustrates the progression of grace from Christ through the Eucharist and the Church as represented by the book and the (unfinished) pastoral chair upon which the Evangelist is seated. On the other folio is the Tree of Vices. The arms hold two scrolls reading: Chains of sin and The stroke of death. The two trees help the viewer to contemplate the nature of grace and sin in order to achieve salvation. Acquired by Lehigh in 1887.